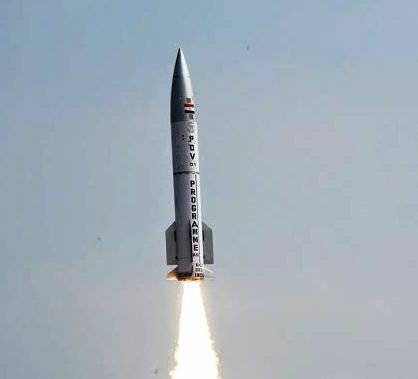 Balasore: India on Tuesday test-fired high-speed interceptor missile Prithvi Defence Vehicle (PDV) against an electronic target from Abdul Kalam Island (earlier known as Wheeler Island) of the Integrated Test Range (ITR) off Odisha coast. Developed by Defence Research Development Organisation (DRDO), the anti-ballistic missile can destroy enemy weapons at high altitude. The data generated during the mission are being analysed, defence sources said. PDV is a two-stage missile and both stages are powered by solid propellants. It is intended to replace the existing Prithvi Air Defence (PAD) in PAD/Advanced Air Defence (AAD) combination. It is designed for engaging targets in exo-atmosphere region at altitude 50 km of earth’s atmosphere. It is guided by high-accuracy Inertial Navigation System (INS) supported by Redundant Micro Navigation System for estimating point of interception. Once missile crosses the atmosphere, its heat shield is ejected and IR Seeker dome is opened to look at target location as designated by mission computer. With help of Inertial Guidance and IR seeker, missile moves for interception. The missile is also fitted with Imaging Infrared (IIR) seeker, developed by DRDO, to distinguish between incoming warheads and decoys. In September last year, a night trial of the mission was conducted.